The researcher’s client acquired the album from an antiques dealer in Wyoming. It turns out that the Wyoming connection may have significance. Anyone with information is encouraged to contact me. If I had to bet I would bet that it is Nettie's album, because the single most personal item is the photo of her in mourning for her mother, Belle Ludlow, at age 4 (# 14). That photo must have come into Nettie's possession via her father, Salmon (Belle's husband), or their Ludlow relatives, whose family papers (which include correspondence from Nettie), are located at the University of Wyoming in Laramie. The Wyoming connection seems too coincidental to discount. The reference to "Kittie" in one of the photos (whether to Kate or, more likely, her daughter Kitty) also establishes a Chase connection. The places in Europe depicted in the CVs are also places that Kate and Nettie are known to have visited (specifically, Germany, Wales, and Scotland). One or both of them were definitely at Inverness and Stuttgart, the subject of a couple of the CVs,. The dates do not quite match up, but there does seem to be a definite connection there. Then we come to the issue of the handwriting. For purposes of clarity I will break the CVs into two categories: Group 1, from Germany (Cologne and Stuttgart), seemingly dated January 1873, though it's not 100% clear it's a "3." Group 2, in different handwriting (more like printing) is from Wales/Scotland--again, places that Nettie and Kate visited. They are dated in July and August 1872. If we assume that the Group 1 cards were dated, contemporaneously, in January 1873 and the Group 2 cards in July/August 1872, by the person visiting those places at those times, then they cannot be in Nettie's handwriting. That is because SP Chase's diary/journal definitively establishes that Nettie was not in Europe at those times. I found a December 29 entry in Chase's diary which has him and Nettie attending church in Washington that day. Obviously she was not in Germany on January 2, 1873, the date of one of the Group 1 cards. And Chase's journal has her in DC all through the summer of 1872 (when her first born was a few months old), so the Group 2 cards cannot be in her handwriting, either. But that doesn't mean it isn't Nettie's album; to the contrary, she might have received the cards from a family member or a friend. She had lived in Germany in 1866-67 and visited both Stuttgart, Germany and Inverness in Scotland/Wales, so the cards might be from someone she befriended during those visits. Which brings us to Kate. We can rule her out as the writer of the Group 2 cards since, again, Chase's diary definitively places her in the US through the entire summer of 1872, when her daughter Kitty was but a few months old. Could Kate be the author of the Group 1 cards, in January 1873? It's possible, but there are some issues here. The handwriting is somewhat similar to hers, but there are important differences. Most notably, if you look at Kate's diary (and other letters) she almost invariably crosses all her "t's" with great emphasis. But in the card from Stuttgart, the two middle t's are conspicuously uncrossed. The "R" on the Royal Palace card is unlike the capital "R's" in her letters, and the capital "C" on Cologne and Cathedral lack the flourish of her capital C's in her letters. However, this isn't conclusive, since a few scribblings on small cards might be written with less flourish than formal letters. So it's not definitive either way. I did find a letter where her father notes she will not be in DC before January 10, 1873. That could mean that she was in Europe, but it's an odd way of putting it if she was overseas. To me, saying, as he did, that Kate would "not be in Washington" before January 10 sounds more like she is somewhere else in the US--most likely, Narragansett, to get away from her husband, who was living in Washington at the time. And January 10 is awfully specific if she was overseas. If she had been overseas I would have expected Chase to say something like she "won't be back from Europe" before January. I went through his other letters and diary and there's no mention of her being in Europe in late 1872/early 1873 (on her prior Europe trips, he always noted her presence in Europe). Passenger lists do not show her going out of or into the US during that time. And Kitty would have been less than one year old in January 1873. I think it more likely she was staying up in Narragansett with Kitty and away from Sprague. Still, it's possible that that the January 1873 notes are hers, again assuming the 1873 date is correct. (she definitely was in Germany in January 1875, which would make more sense, although the numeral doesn't look like a "5."). Another possibility: were the dates put on by someone at later times, and either misdated, or did not relate to the actual dates of visit? Possible but I think very unlikely, as the dates have the feel of having been placed there contemporaneously with the visits. It’s also possible this is a cumulative album, put together and added to at different times over the years and possibly by different people. All in all, I'd say the album is either Nettie's or one of the Ludlows, and that the CVs are from friends or family members and, for Group 1, possibly Kate. One additional factor pointing to the Ludlows is that some of the Civil War officers depicted in the album seem to be from New Orleans and Virginia, and the Ludlows had connections to both places. I was extensively interviewed in this documentary on the Christie Mullins case. The episode was very stylishly done. Mary Tyler Moore died today at age 80. She was an extremely talented, intuitive actress (comedy and drama) with no formal training. Had a great sense of timing. Not all of the MTM episodes hold up today; some are dated or a little silly, but many if not most were very good, and almost all had some belly laughs. TV comediennes like Jennifer Aniston, Tina Fey, and Julia Louis-Dreyfus can trace their roots to her. She definitely had a dark side that the public and even co-workers often didn't see (it pre-existed the fallout from the death of her son). It was memorably on display in the film "Ordinary People." It sprang from an unhappy childhood that she never fully forgot. She could be difficult to work with, at least in later years, on less successful ventures than her hit shows, and she did not hesitate to criticize the creative personnel whom she felt let her down. She was a complex, multifaceted woman who could veer between sunny and overcast. “I’m like a chameleon in that I take on the colors of success or failure, happy or sad, depending on what’s going on, or how it seems to be going on,” she once explained. She was quite private and reserved, but had a strong, indomitable streak, as evidenced by her long bout with Type 1 diabetes and shooting herself up with insulin twice a day for years. Many people have Type 2 diabetes, and it's a serious thing, but it is not nearly as debilitating as Type 1. Her animal rights activism was real, and ahead of its time, like her vegetarianism. Over the years I've interviewed lots of showbiz people, and I would say she was very much like many of them: someone who became an actor to escape or obscure her private life. Great actors really are a different breed from you and me; they absolutely crave--indeed, can't live without--that attention that comes from being on stage or before the camera. She certainly was that way. Asked once how she would like to be remembered, Moore responded, “as somebody who always looked for the truth, even if it wasn’t funny.” To her, the truth was that life is a mixture of joy and sorrow. She was, as she described herself, a “devotee of laughter and tears,” and said that if asked to choose between making people laugh or cry she would be unable to do so. That is why her most famous tour de force as an actress came in an award-winning sixth season episode of The Mary Tyler Moore Show entitled “Chuckles Bites the Dust.” (https://www.youtube.com/watch?v=ihLJrcS8lsg).https://www.youtube.com/watch?v=ihLJrcS8lsg). Ranked # 1 by TV Guide in its 1997 list of “The 100 Greatest TV Episodes of All Time,” it is the best thing she ever did. In it, the oft-mentioned but seldom seen character Chuckles the Clown, dressed as a peanut in a local circus parade, is killed when a rogue elephant tries to shell him. The freak accident becomes the source of macabre jokes among the WJM newsroom staff, except for Mary, who fails to see the humor in the clown’s demise and admonishes her co-workers to show some respect for the dead. But then, at the funeral, she suddenly breaks out in quiet giggles during the reverend’s eulogy at the mention of various characters Chuckles created (“Mr. Fee-Fi-Fo,” “Billy Banana,” “Aunt Yoo-Hoo”). She receives looks of disapproval from the other, somber mourners, including the same people who were cracking jokes earlier. Mary tries to mask her escalating snickers as coughs and throat clearings until, unable to suppress it any longer, she lets loose with loud guffaws. The reverend asks her to stand and, instead of scolding her as we might have anticipated, tells her to laugh if she feels like it—that nothing would have made Chuckles happier, that he hated to see people cry. “So go ahead, my dear, laugh for Chuckles,” he says, at which point Mary bursts into uncontrollable, full-throated sobs. She didn’t have to choose between laughter and tears after all. In the twenty years since publication of “Jean Arthur” I have come across a fair amount of new information, not included in the book, that deserves to be recorded in some fashion for the benefit of future researchers and Jean Arthur fans. Most of it relates to her childhood and family, which were lightly touched upon in the book. I did some further research and learned quite a bit in preparation for speaking at “Jean Arthur Day” in Plattsburgh, New York (her birthplace), held in April 2015 to mark the unveiling of a plaque in her honor in front of the house where she was born. I am grateful to David Palmieri for organizing that event and for providing me with some of the additional information about “Gladys Greene” (Arthur’s birth name) and her family that follows here. Thanks also to Lee Greene for his work on Ancestry.com, and to Eva Scherzer from Austria, perhaps the world’s foremost collector of Jean Arthur memorabilia, who supplied me with many photographs and other mementos. As will be seen below, I have included a number of photographs here that did not appear in my book and have not previously been published. In my book I described Hubert Sidney Greene, born in 1863 in St. Albans, Vermont, as an itinerant cowboy, painter and photographer out West in his youth, and all of that remains true. However, it seems that he began his career as a commercial photographer earlier than I had realized. He first shows up as a house and sign painter in a Montana Regional Directory in 1884 (perhaps working for his future father-in-law, Hans P. Nelson, who ran a house and sign painting business in Billings at the time). In the Dakota Territory Census of 1885 he is listed as an artist living as a boarder in the city of Abercrombie. Then in the latter half of the 1880s he is back in Billings, operating a photography studio (which may have gone bust). And here are some photos of him in later years: (1) around 1924 (from Ancestry.com); (2) at the home in Hollywood that Jean bought for him and Hannah; and (3) in Montana, with Georgianna Nelson (Hannah's mother), while living in a trailer Jean bought him so he could resume painting the American West of his youth that he so loved (latter two photos courtesy of Arthur and Miriam Goodall). The Greenes left Billings to move back east around 1897, as by 1898 Hubert and family were living at 23 South Platt Street in Plattsburgh, on the edge of town. He was now employed as a photographer for the George T. Woodward studio at 17 Clinton Street in downtown Plattsburgh, a mile’s trolley ride from the residence on South Platt. On April 1, 1898, around 1 a.m., 27-year-old Hannah gave birth at home to twin boys who each died within six hours. A local small-town doctor, David Kellogg, recorded in his diary that Hubert Greene had come to Kellogg’s home earlier that night and suggested that the doctor might want to go to the Greene residence soon, as Hannah apparently was nearing labor. But Kellogg told the 34-year-old Greene to go back home and that if he needed him, he would go there quickly. Greene shortly returned to the doctor’s home and Kellogg arrived at the Greenes before 2 a.m., by which time the two boys (christened Sidney and Hubert) had already been born. Whether Kellogg remained present at their deaths is not recorded. By 1900 the Greenes were in their apartment at 94 Oak Street, less than a ten-minute’s walk to the Woodard Studio for Hubert. They moved again a couple of years later, being listed in the 1902-1903 City Directory at 71 Bridge Street (an address that no longer exists and is now the site of an Amtrak station parking lot). The Bridge Street residence was somewhat larger than the apartment on Oak Street and less than a five-minute walk across the Saranac River to Woodward’s. The Greenes do not appear in the 1904-1905 Plattsburgh City Directory, and in my book I wrote that they next show up in 1908 in Portland, Maine, where Gladys attended school and her father again found work as a photographer for the Lamson Studio at 655 Congress Street (shown here in 1906, photo courtesy of David Palmieri). The gap years between 1904 and 1908 were, and to some extent remain, a mystery, but in preparing for “Jean Arthur Day” I found a 1905 New York State census listing for the Greenes (taken in June 1905) at 12 Pine Street in the village of Saranac Lake, New York (town of North Essex). This was an idyllic location about 50 miles southwest of Plattsburgh. Hubert is again listed as a photographer. Dave Palmieri, who has done extensive research on the Greene family, calls this a “real find” that adds a fourth place to those where Gladys resided during her grade school years. Perhaps Hubert was working on assignment for Woodward in Saranac Lake, a picturesque location and haven for tuberculosis patients from New York City who were treated at the sanitarium there. 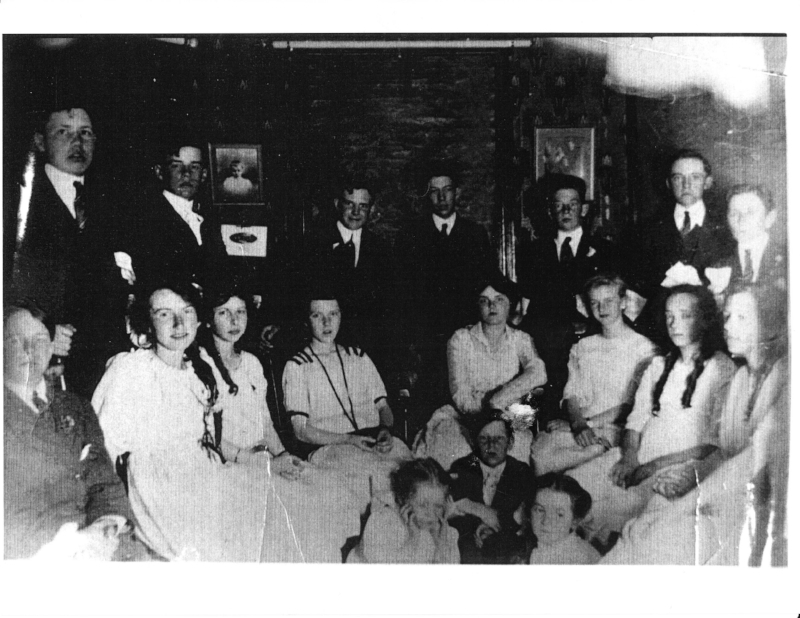 I have not been able to determine how long the Greenes stayed in Saranac Lake; that question, as well as any further whereabouts for the family between 1905 and 1908, remains for future researchers. So, this narrows the “lost years” somewhat: the Greenes were in Saranac Lake as late as November 1906, when Glady would have been in the first grade. They likely stayed there for some time beyond her baptism. Hubert Greene shows up in the Portland, Maine city directory in 1908 (information current as of March 1908), although it’s not clear the whole Greene family was with him that early. Assuming the entire family was in Portland by March 1908, that leaves maybe only one “lost year” between Saranac Lake and Portland. The Greenes had their main residence in Portland from 1908-1912, living at 1 Marie Terrace the first two years and 292 Congress Street the last two years. (1 Marie was either at or right next to 292 Congress). 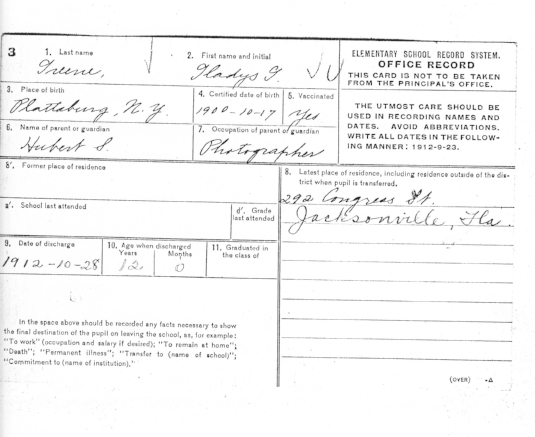 As noted in my book, as early as 1909 Hubert Greene was in Jacksonville, Florida, where he took seasonal work with George Woodward, who was in the process of moving his photography operations there to be near his wife’s family (Woodward finally sold his Plattsburgh shop in 1912 and relocated permanently to Jacksonville). Gladys was in Jacksonville at least around 1913-1914, and may have been there in 1909 with her parents, or may have stayed up north with relatives. In the 1914-15 school year (eighth grade for her) she lived with a cousin in Schenectady, New York, where her paternal grandparents also lived. She may also have lived in Schenectady for a time with relatives earlier in her childhood. 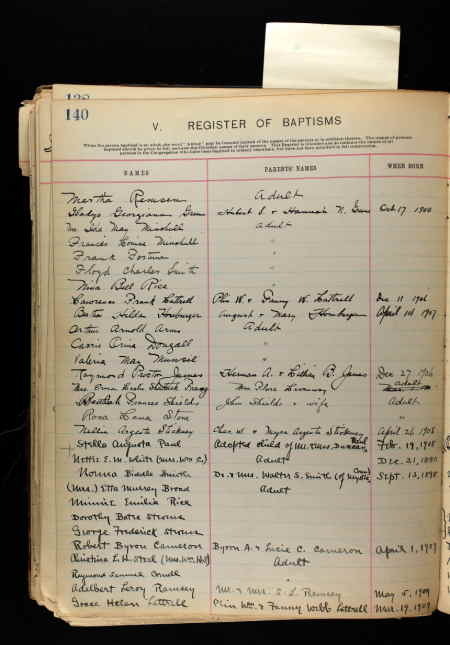 Hubert and Hannah continued to be listed in Jacksonville directories through 1917, although by then Gladys was living in New York City with her parents, and she and her mother, at least, continued to spend time in Portland. Jacksonville seems to have remained a seasonal residence. Everything I know confirms that her family indeed led a nomadic existence, both because her father's work took him here and there, and his marriage to Hannah was an off-and-on proposition that led him to walk out on them from time to time. I believe there were intervals where Gladys was living alone with her mother, and perhaps one or two brothers, separate from Hubert, but it's hard to be more precise about the actual timeline. As I wrote in the book, in her divorce petition many years later, Hannah alleged that Hubert had deserted her on June 1, 1909 in Jacksonville and that he remained "separate and apart" from her from that day forward, although in light of other evidence that seems an exaggeration. (For one thing, the 1910 federal census lists the entire family living together in Portland at 292 Congress). My book revealed little about Don Greene, Jean Arthur’s oldest brother, beyond a couple key bookended and documented facts: he was born January 15, 1890—six months before his parents’ marriage (a fact his mother obscured to hide his illegitimacy), and he committed suicide in 1967 in Carmel. In between I described him as a drifter, much like his father, who seemed to live off his sister’s largesse. I can now provide a fuller picture of Don Greene, although it’s not very flattering. After publication of my book I received a letter from a Lorna Doxey, his granddaughter, with whom I had no prior contact. Don’s children were Hubert Don Greene and Gladys Alice Greene (Lorna's mother), who obviously were named for Don’s father and sister. Ms. Doxey recounted that her only meeting with her great-aunt, Jean Arthur, came in 1965, shortly after the unexpected passing of Lorna’s mother (Don’s daughter). In January 1965 Jean wrote to Lorna’s father and requested that he and Lorna fly to Carmel from their home in Los Angeles to inform her grandfather Don of his daughter’s death. At that time Don was in ill health and was living with Jean at her Carmel home at her expense. Jean was not in Carmel at the time, but paid the air fare, lodging and car rental for her visiting relatives. At her meeting with her grandfather, Lorna found him to be “cold, critical and distant.” She was eleven at the time. After she called him “grandpa” he told her, “Don’t you ever call me that. You call me Don Greene.” Don had married an Amena Bretschnider in Portland, Maine in 1911 but the marriage didn’t last; they lived for a time in Exeter, New Hampshire, but according to Lorna, Don soon deserted (a fact supported by Don’s 1917 draft registration card in which he lists himself as “single” and working as a carpenter in Glendive, Montana). Following the pattern of his father, Don may have returned to his wife from time to time, as the formal divorce was not issued until 1930 in New Hampshire. Shortly thereafter he moved to Los Angeles, where Jean and her parents were then living, and in 1935 he was listed as running a restaurant at 1706 1/2 Vermont Avenue (which eventually failed) with a “Margaret” Greene. Their residence was on Sunset Boulevard. No record of any marriage to (or further trace of) Margaret has been found, so she may have been a live-in companion. Lorna Doxey said that Don Greene was a concert-level violinist or cellist. He was also, apparently, an alcoholic (as was his father and, to a certain extent, Jean Arthur). His final years must have been difficult, as his death certificate records that he was “despondent” and slit his wrists. Undoubtedly it was trying for Jean as well; according to Lorna, Jean wrote to Lorna's mother Gladys (Don's daughter) in 1963 to ask for money to help defray the expenses of caring for him, but Gladys thought that was bizarre and tore up the letter. I have not been able to find any pictures of Don Greene. In his draft registration card he described himself as short and slender, which would match the physical characteristics of his father, Hubert. Lorna Doxey did get to meet her great-aunt Jean Arthur, by then a major star, in Los Angeles in February 1965 while she was filming an episode of “Gunsmoke.” Lorna described Jean as gracious and generous, if peculiar and idiosyncratic. It was the only time they met. Not much is known about him. It does not appear that he ever married. 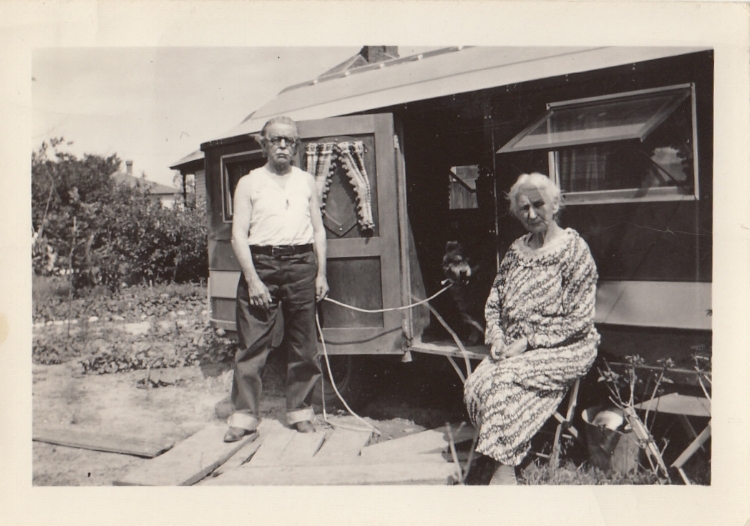 He worked as an awning maker, a clerk and traveling salesman while living in Portland betwen 1910 and 1912. He listed himself as an iron worker in Bristol, Massachusetts in his 1917 draft registration card. He also lived for some time in Los Angeles, where his sister may have gotten him a job as a Hollywood studio hand. Jean Arthur’s youngest brother, Albert, was born in Billings, Montana the day after Christmas in 1894 (some sources suggest 1896, although I believe 1894 to be correct). He is pictured here (first, with his brother Bob, in Jacksonville in 1913, courtesy of Arthur and Miriam Goodall), and next, in his World War I uniform (from Ancestry.com), followed by two additional photos from Ancestry.com. I have not attempted to track down any living descendants of Albert’s two sons, who would have been nephews of Jean Arthur. It seems likely there may be some. This is another avenue for future scholars to pursue. The details of Albert Greene’s military service and death are still a little murky. As I wrote in my book (at p. 307), Hannah claimed that he was killed in World War I, which is untrue because he showed up in later city directories in Portland and New York City (not to mention fathering sons born in 1920 and 1922). A family genealogy entry in Ancestry.com states that “the mustard gas poisoning he experienced in Europe led to his early death in 1926 at age 32,” but I could find no documentation for this. Possibly exposure to the chemical weapon caused bronchial problems that became worse with time, or maybe it is a family legend. I received an email from Brian Greene, the grandson of Jean Arthur’s brother Albert Greene, which makes him a grand nephew of Jean Arthur. He provided some further insight and details about Albert’s life and death. He confirmed that Albert did marry Gladys Mildred Gregory (who went by Mildred) before entering WWI. In the war, Albert served as an aerial photographer, one of the first men to take pictures from a biplane during a war. He took pictures of, among other things, the Eiffel Tower during a mission to France. Brian Greene also confirmed that Albert was a victim of mustard gas during the war while in France which destroyed his lungs. This gained him a discharge from service after barely a year, after which he returned to NYC to live with his wife. 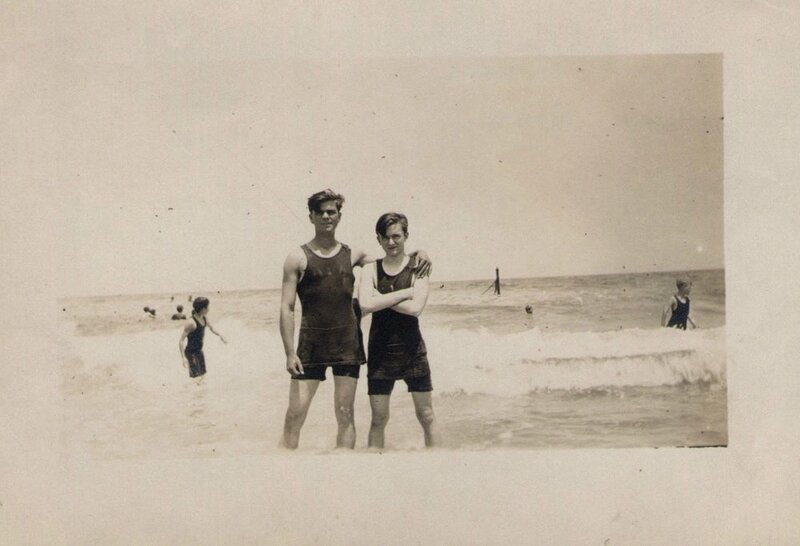 Albert and Mildred had two sons, Albert Jr., born in 1920 in Portland, and Don William, born in 1922 in New York City. Albert Sr.’s health continually deteriorated and by the time he was 30 he was dying. The Greenes took him to “Arizona” hoping the hot dry air would be good for him, although it’s possible that Los Angeles, near Jean, was the intended final destination. According to a death certificate from Los Angeles that Brian found, Albert Sidney Greene died on January 26, 1926 at age 31. That would be consistent with the 1894 birth date that I believed to be correct, rather than the alternative 1896 date that some sources claim. As I pointed out in my book, Jean Arthur always publicly maintained (falsely) that she was born and grew up in Manhattan. I suspect this was either because she was ashamed of her relatively dull and ordinary small town roots, or else she thought a New York City background would sound more glamorous and sophisticated to Hollywood studio people. But it’s true that she did move with her family to the Washington Heights neighborhood in Manhattan, and as I originally wrote, by the summer of 1915 they were living at 573 West 159th Street. Hubert took a job with photographer Ira L. Hill at 433 Fifth Avenue (off West 37th Street). Hill was the city's foremost fashion photographer, specializing in beautiful women and theater actresses. Sometime thereafter Don Morse shipped off to France and served in several major battles. There is no indication that the relationship lasted beyond that summer. He ended up marrying a Brooklyn girl in 1924 who, according to his daughter, knew about the prior relationship and would never go to see Jean Arthur’s movies. Above: Jean Arthur in Hollywood, August 1924 (courtesy of Myrl Wyman). Below: sketch by an unknown artist from same time period (courtesy of Eva Scherzer). In my book I included a filmography of 89 films in which Jean Arthur’s appearance is well documented. From time to time since I’ve come across other lists, on sites such as IMDb and Wikipedia, that purport to include additional early silent films in which Jean Arthur appeared as an uncredited extra. Among the more common additions are Wine of Youth (MGM, 1924, as an uncredited “auto reveler”); The Iron Horse (Fox, 1925, uncredited reporter); Winners of the Wilderness (MGM, 1927, unspecified bit part); and Easy Come, Easy Go (Paramount, 1928, also unspecified bit part). I am skeptical of these claims, which are unverified and may be based on nothing more than someone thinking they spotted Jean Arthur in the film (actresses from the silent era often looked strikingly similar, with their short, dark, bobbed hair of the type worn by Jean before she turned blonde). I am particularly dubious of the claims for Wine of Youth and Winners of the Wilderness, as Jean almost never worked for MGM. The Iron Horse is more plausible in theory, since it was directed by John Ford, who also directed Fox’s 1923 Cameo Kirby in which Jean appeared. However, I personally watched the film and could find no sign of her. If she was in it, it was a “blink and you miss her” type role. Easy Come, Easy Go is perhaps the most plausible possibility among these, since Paramount was Jean Arthur’s home studio at the time and it starred Richard Dix, who also starred with Jean in Paramount’s Warming Up that same year (1928). But the film is lost and there is nothing to document that she was in it. I’m more than willing to add any of these or other films to the Jean Arthur canon if someone has proof, but in the meantime I am sticking with my list of 89. 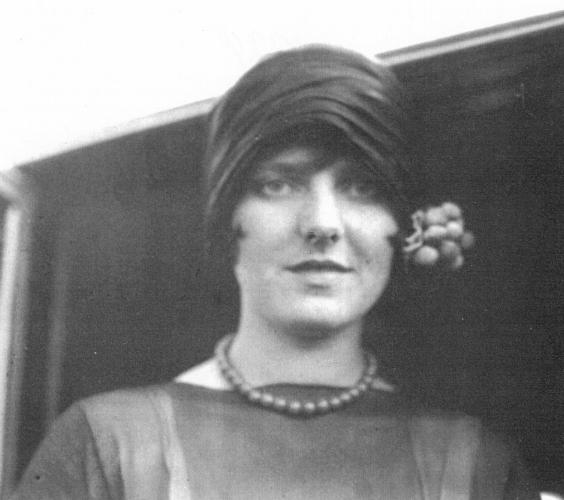 In my book I included the few commonly reported facts about Julian Ancker, Jean Arthur’s first husband, whom she married in 1928 before having the marriage annulled (per legend, the very next day). He was Jewish, a photographer, reminded her of Abe Lincoln physically, and died of sunstroke shortly after the annulment. The reasons for the annulment are murky. Some said it was because she discovered that her studio contract forbade marriage and he sued for annulment when she failed to consummate the marriage. Jean maintained that she simply realized immediately that she had made a mistake. Also, according to her, both sets of parents had opposed the union. I still haven’t found any written record of the marriage or divorce. But Ancestry.com adds some details to Ancker’s life. He was born in California in 1899 (or possibly 1902) to parents born in Germany. He was tall and slender, with dark hair, consistent with Jean’s description. He ran a theater in Arizona in the early 1920s, and died in 1932 in Los Angeles around age 30 (cause not specified). In the 1930 federal census he is listed as divorced, confirming that there had in fact been a marriage. The photo is from about 1925 or so, which indicates that Ancker was a studio photographer at the time. That is likely how he met Jean Arthur. See also David Palmieri, “The Jean Arthur Plattsburgh Never Knew,” Lake Champlain Weekly, Dec. 30, 2009-Jan. 5, 2010, Vol. 10, Issue23. My Book, the Movie . . .